A revolution is about to occur in emergency call handling and triage. Until now we have relied on audio assessment of emergencies through the emergency (999/911/000) phone number. But most calls are made from mobile phones which have a wealth of inbuilt technology to aid triage decisions. 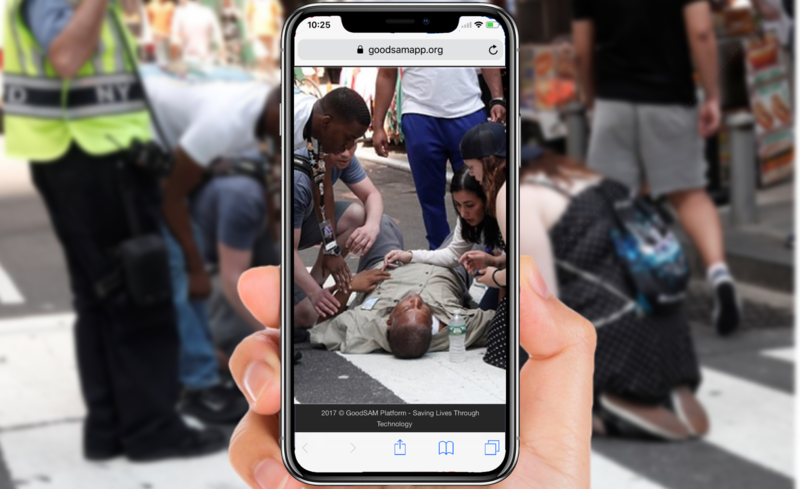 The GoodSAM Instant-on-Scene™ module sends a text containing a link*, that opens the caller's camera so that the call handler / clinical advisor can see for themselves what the caller is trying to describe. A better understanding of the clinical urgency means better resource management - faster help to those who need it most as well as better, more confident advice to those whose situation is not urgent. "Remote Triage" can be of the scene (e.g. number of vehicles in an accident / size of the fire) or the patient (pale / in distress etc). The system works across all up to date Android, Windows and Apple mobile phones. The system also locates the caller on a map and enables additional two-way communication (for example, enabling visualisation of telephone CPR). The video is encrypted and not stored on the caller's phone. The stream is one to one or to multiple, with the Ambulance Service being able to direct the stream to other emergency and HEMS services. Multiple options are available for non-storage and storage of video. All exceed HIPAA, NHS data and governance requirements. * with their permission - they are sent a text message which they have to click on. We would really appreciate it if you could help us spread the word around; you can click here for our brochure and here for our poster. If you need anything else please contact us directly.